The roots of the pharmaceutical industry lie back with the apothecaries and pharmacies that offered traditional remedies as far back as the middle ages, offering a hit-and-miss range of treatments based on centuries of folk knowledge. But the industry as we understand it today really has its origins in the second half of the 19th century. Whilst the scientific revolution of the 17th century had spread ideas of rationalism and experimentation, and the industrial revolution had transformed the production of goods in the late 18th century, the marrying of the two concepts for the benefit of human health was a comparatively late development. Merck in Germany was possibly the earliest company to move in this direction. Originating as a pharmacy founded in Darmstadt in 1668, it was in 1827 that Heinrich Emanuel Merck began the transition towards an industrial and scientific concern, by manufacturing and selling alkaloids. 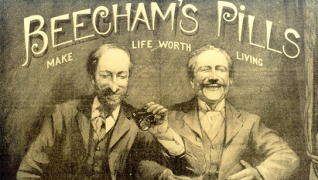 Similarly, whilst GlaxoSmithKline’s origins can be traced back as far as 1715, it was only in the middle of the 19th century that Beecham became involved in the industrial production of medicine, producing patented medicine from 1842, and the world’s first factory for producing only medicines in 1859. Meanwhile in the USA, Pfizer was founded in 1849 by two German immigrants, initially as a fine chemicals business. Their business expanded rapidly during the American civil war as demand for painkillers and antiseptics rocketed³. Another military man in the drugs business was Edward Robinson Squibb, who as a naval doctor during the Mexican-American war of 1846–1848 threw the drugs he was supplied with overboard due to their low quality. He set up a laboratory in 1858, like Pfizer supplying Union armies in the civil war, and laying the basis for today’s BMS. Switzerland also rapidly developed a home-grown pharmaceutical industry in the second half of the 19th century. Previously a centre of the trade in textiles and dyes, Swiss manufacturers gradually began to realise their dyestuffs had antiseptic and other properties and began to market them as pharmaceuticals, in contrast to the origin in pharmacies of other enterprises. Switzerland’s total lack of patent laws led to it being accused of being a “pirate state” in the German Reichstag. Sandoz, CIBA-Geigy, Roche and the Basel hub of the pharmaceutical industry all have their roots in this boom. It wasn’t just Swiss companies had their roots in the dye trade. Bayer was founded in 1863 as a dye maker in Wuppertal, the hometown of Karl Marx’s collaborator Friedrich Engels. It later moved into medicines, commercialising aspirin around the turn of the 20th century, one of the most successful pharmaceuticals ever at that point. The unregulated nature of the trade in medicines during this period ensured there was a far less strict delineation between “pharmaceutical” and “chemical” industries than we have nowadays. These companies focused as much on cod liver oil, toothpaste, citric acid for soft drinks, and hair gel as on prescription medicines, as well as selling products like heroin on the over-the-counter market. The national rivalries and conflicts that characterised this period also had their impact on the developing industry. 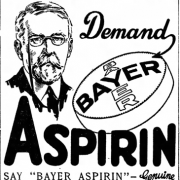 Bayer had the aspirin trademark and its US assets seized during World War One, whilst “American” Merck (now Merck & Co. in the US or Merck Sharp & Dohme [MSD] elsewhere) was compulsorily split off from its Germany parent company (Merck KGaA) at the same time.¹ Bayer also had its Russian subsidiary seized during the Russian revolution. This disruption to Germany’s position as the leader in pharmaceuticals in the early 20th century by the war meant that others, particularly in the US, could take relative advantage. The beginnings of the globalisation of the industry were seen both before and after the war – in the UK, import duties incentivised many foreign companies such as Wyeth, Sandoz, CIBA, Eli Lilly and MSD to set up subsidiaries in Britain in the post-war years. The period between 1918 and 1939 was marked by two breakthroughs that presaged the arrival of the pharma industry as we know it today. The first was insulin, Frederick Banting and colleagues managed to isolate insulin that could treat diabetes, up until that point a fatal condition. But it was only in collaboration with the scientists at Eli Lilly that they were able to sufficiently purify the extract and industrially produce and distribute it as an effective medicine. The second was penicillin, a discovery of an impact possibly unparalleled by any other in medicine. After Alexander Fleming’s initial discovery of the penicillium mould’s antibiotic properties in 1928, and Howard Florey and Ernst Chain’s further experimentation, a government-supported international collaboration including Merck, Pfizer and Squibb worked on mass producing the drug during World War Two, saving thousands of soldiers’ lives. The immense scale and sophistication of the penicillin development effort marked a new era for the way the pharmaceutical industry developed drugs. The war had also encouraged research into everything from new analgesics to drugs against typhus, with a great deal of collaboration between the companies and government. After the war, the arrival of social healthcare systems such as the UK’s National Health Service (NHS) in Europe created a much more structured system, both for prescription of drugs and their reimbursement. In 1957, the NHS brought in what was essentially a price fixing scheme to allow reasonable return on investment for drug manufacturers, solidifying the incentive to invest in new medicines. The US pharmaceutical industry was booming, thanks to being part of the world’s biggest and most dynamic economy. 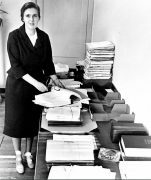 Its growth was also helped by generous funding from government, with the National Institutes of Health seeing its federal funding rise to nearly $100 million by 1956. This investment fuelled the development of drugs to come over the coming decades. Meanwhile, as the industry grew wealthy thanks to its growing portfolio of products, the potential ethical conflicts of making money from selling healthcare products became increasingly apparent. This public-spirited industry still required greater oversight, however, and government regulations on medicines increased on both sides of the Atlantic. The Thalidomide scandal of 1961 prompted an increase in the regulation and testing of drugs before licensing, with a new amendment to US Food and Drug Administration (FDA) rules demanding proof of efficacy and accurate disclosure of side-effects for new medications (the Kefauver Harris Amendment) being implemented in 1962. Likewise, the 1964 Declaration of Helsinki put greater ethical strictures on clinical research, clearly cementing the difference between production of scientific prescription medicines and other chemicals. Fordian methods enabled more rational methods of mass production, and increasing understanding of biology and chemistry enabled drug candidates to be chosen systematically rather than discovered serendipitously. This ‘golden age’ of drug development took place in the broader landscape of the post-war boom, a general context of massive improvements in standards of living and technological optimism that characterised the 40s to the early 70s, as well as the science-boosting competition of the cold war. As the barriers to entry in drug production were raised, a great deal of consolidation occurred in the industry. Likewise, the processes of internationalisation begun before the war were continued – in 1951 alone Pfizer opened subsidiaries in nine new countries. The list of novel drugs from the post-war era speaks for itself. The contraceptive pill, introduced in 1960, had an impact on society almost as massive as that of penicillin, enabling women to effectively control their fertility and enabling sexual equality for the first time. Valium (diazepam) was brought to the market by Roche in 1963, followed by the introduction of the monoamine oxidase inhibitor (MAOI) class of anti-depressants and antipsychotic haloperidol. These drugs ushered in a new era of psychiatric treatment, adding pill-based treatments to the psychoanalytic ones that had previously characterised psychiatry in this era. The 1970s provided a wave of cancer drugs, as part of the US government’s “war on cancer”, a recent report from Cancer Report UK showed that survival rates have doubled since the early 70s – due in large part to the massive innovation in oncology medicines that has occurred since then. ACE inhibitors arrived in 1975, improving cardiac health, and even drugs as ubiquitous as paracetamol and ibuprofen were developed in 1956 and 1969 respectively. As the 1970s drew to an end, a shift began in the way the pharma industry focused its energies. In 1977, Tagamet, an ulcer medication, became the first ever “blockbuster” drug, earning its manufacturers more than $1 billion a year and its creators the Nobel Prize. This marked a new departure as companies competed to be the developer of the next big blockbuster, and many achieved great success. Eli Lilly released the first selective serotonin reuptake inhibitor (SSRI), Prozac, in 1987, once again revolutionising mental health practice. The first statin was also approved in 1987, manufactured by Merck (MSD). But whilst there were some breakthroughs, the enormous expense and risks involved in R&amp,D caused many to merely ape their competitors, trying to get a cut of market-share using “me too” formulations rather than innovating novel medications. For example, AstraZeneca’s popular proton pump inhibitor Nexium (esomeprazole), released in 2001, is merely a purified single isomeric version of an older drug which happened to be losing patent protection. Patents, or the lack of them, became a problem for the industry. The Hatch-Waxman Act of 1984 regularised generic production in the US, and some developing countries made policy decisions to ignore medical patents. The industry’s focus increased on marketing to maintain market share, on lobbying politicians to protect commercial interests, and on lawyers to enforce legal claims on intellectual property rights. These activities have brought a greater suspicion of the industry in the public at large. However, this can be linked to a wider anti-science feeling and more pessimistic outlook on the possibilities of technology in society, as seen in panics over issues such as genetically-modified crops and suspicion towards nuclear power. Companies have tried to overcome some of these problems by outsourcing various aspects of their processes, and through buying up smaller companies that perhaps retain more of the innovative entrepreneurialism of the pioneers of the 19th century. But new technologies are what really promise a positive future for the industry in the 21st century. Both computing and biotechnology have allowed great leaps forward in both development and production of new drugs. Automation of the drug discovery process through high-throughput screening, and the computerisation of genomics have allowed breakthroughs at a much higher rate than previously. Starting with insulin in the 1970s, genetic modification has allowed production of human proteins by bacteria. And biological drugs such as the monoclonal antibodies, introduced around the turn of the millennium, hint at a whole new panorama of far more specific drugs that could impact on human health as much as the medicines of last century. Robin Walsh is a freelance writer on healthcare and the pharmaceutical industry. He is currently training to be a doctor, and previously worked in medical communications. He can be contacted at Robwalsh9@hotmail.com.